The Grey Lady loves strawberries. But so does the Strawberry Snatcher, and unfortunately for the Grey Lady he is not far away and getting closer all the time. Past flower shops and bakeries he stalks her, silently, steadily, biding his time. He pursues her by foot along haunting red-brick paths, and then by skateboard into the mysterious depths of a swamp both beautiful and terrifying. 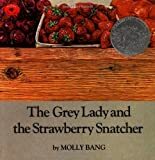 Closer and closer he gets, and yet the Grey Lady escapes him, in fantastic and marvelously improbable ways, until, in the heart of the forest the Strawberry Snatcher discovers instead -- blackberries! In this wordless allegory, author-illustrator Molly Bang has created a visual feast full of surprise and wonder. Her lively tale skillfully blends fantasy, suspense, and humor, and the magnificent illustrations are a treat for young and old alike.